BENSALEM, Pa. (WPVI) -- Police have charged two men in connection with an assault at a Bucks County bar. 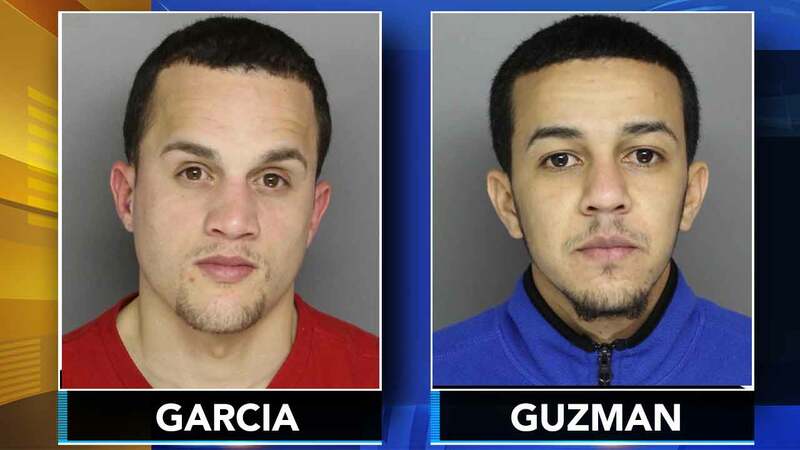 After receiving numerous tips, Bensalem police were able to identify and arrest 25-year-old Jomar Garcia and 24-year-old Samuel Guzman. Garcia was charged with Aggravated Assault, Conspiracy, Simple Assault, Recklessly Endangering another Person, and Possession of Instruments of Crime. His bail was set at $75,000. Garcia has been released on his own recognizance. Guzman was charged with Simple Assault, Conspiracy, and Reckless Endanderment. Surveillance video of the the December 20th assault at Big Heads Bar on Street Road was released last week, along with images of four suspects. Surveillance Video: Assault at Bensalem bar on December 20, 2017. Police say one of the suspects got into an argument with the bartender and threw a punch. A scuffle ensued between the four suspects and employees that were trying to remove them from the bar. Police say one of the male suspects struck an employee in the head with a bottle and caused a serious laceration to his head. Another suspect picked up a pool cue and began swinging it at employees. All four men then fled from the bar in two separate older model 4-door gray vehicles, police say. According to authorities, a woman seen in the video was not involved in the altercation, but appears to know the suspects. Police are asking for more tips as they look to make more arrests in this case. Anyone with information should contact Bensalem police at (215) 633-3719.